Edinburgh Frontrunners (EFR) formed about six months after I came out and by pure fluke I happened to turn up to the first official club run. Up to this point I’d been running on my own for about three years, frequently but over short distances, and it had become an essential release for a lot of the feelings and frustrations I was processing as I was coming out to myself. Within a few months from that first club run my pace, distance, and overall fitness had shot up, and for the first time I felt part of the LGBT community. And then in May 2014 EFR had its first official outing in a race, in our first official club kit, and suddenly there was the rest of the Frontrunners movement too. Frontrunners from Glasgow, Newcastle, Manchester and London turned up to race, and a large crowd joined us to socialise and go out on the town afterwards. Since then EFR have hosted members of Frontrunners clubs all over the UK, the US, Canada, France and more on our weekly runs; and we’ve joined GFR, NFR, and MFR for events and races. I now know runners all over the world, and have standing invitations on several continents. To me, running is now an essential part of my life and self-identity. It’s a way of keeping fit and healthy, feeling good, dealing with stress, and having fun. With EFR, it’s now also a major part of my social life: I’ve met so many properly lovely people and made some awesome friends all over the country and rest of the world, and I’m now planning my year and holidays around the racing calendar. The ability to be who you really are within the club makes people feel safer to be their true selves outside the club too – I’ve felt that change in myself and I’ve seen it in others. That all-welcoming, all-inclusive atmosphere of EFR (and my friends within it) has been an essential background to figuring out I’m non-binary, and I know that I’ll be part of the club and frontrunner community whatever. It’s incredible to be able to rely on that support and acceptance, to be able to turn up to a club social in 4” heels and nail polish and feel totally safe. This is why EFR represents to me the best of the LGBT+ community: regardless of where you fit on the LGBT+ spectrum, or off it, and regardless of running ability, we’ll make you welcome. Edinburgh Frontrunners is Edinburgh’s running club for LGBT people and their friends. 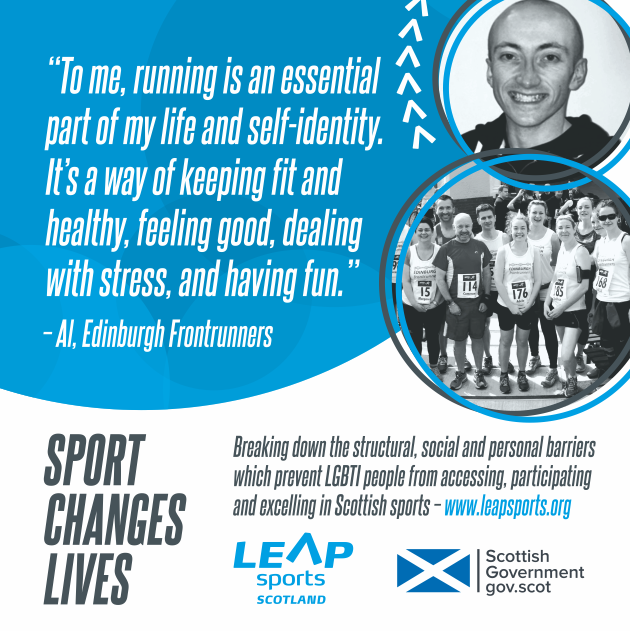 Membership is open to all, regardless of age, gender identity or expression, sexual orientation or running ability; this is reflected in our hugely diverse membership. We are also a Jog Scotland group, running regular walk-to-jog training programmes. We have a parallel walking group. Written on 6th January 2017.